The popular singer has opened up about how much he spent to pay American artists he has worked so far during a recent meeting between Tanzanian musicians and the Tanzania Communication Regulatory Authority. 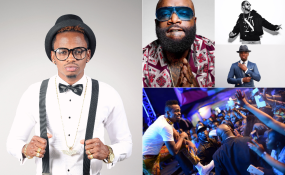 Diamond has collaborated with international artists such as Ne-Yo, Omarion and rapper Rick Ross, and it apparently it cost him millions of shillings. The singer revealed that Ne-Yo charged him U.S.$104,000 for the Marry You song, while Rick Ross asked him for U.S.$56,000 for the video shoot of Waka. The Bongo singer has now revealed he has approached rapper Tyga to work with him on a new project and that the artist is demanding to be paid U.S.$150,000 before he could agree to any collaboration. According to Mpasho, Diamond emphasized that the music industry had evolved and the market standards are high and it's only going to get worse with time. He also added that the industry is full of competition, therefore, artists are forced to invest in their work and put out good records that can sell them to the international market.